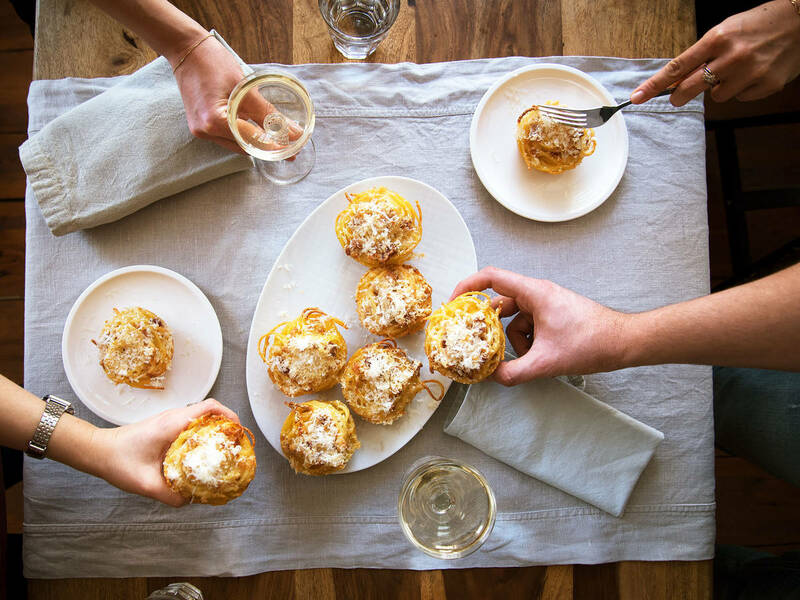 Drum roll, please: It’s our very first Kitchen Stories Community Pick—a creative and fun recipe for carbonara muffins by Laura. We’d bet you’ve never seen pasta like this before. Of course, the muffins taste of the Italian classic, spaghetti carbonara, where soft pasta meets crispy bacon, umami-laden Parmesan, and creamy egg yolk. But Laura turns the old standby on its head by doing something no one expected: baking it in muffin tins. The adorable and flavor-packed muffins will delight your guests, surprise your colleagues, and satisfy your own cravings. We love this recipe because it’s a failsafe crowd-pleaser with wow-factor. It’s more than the perfect party food—it’s also a lovely way to repurpose pasta leftovers and is easily transportable for your next picnic, office, or school event. Young and old will love these versatile muffins that can be enjoyed hot or cold and packed in lunch boxes as a next-day treat. We recommend filling the muffin cups above the rim to create prettier and more substantial muffins. And if you’re a fellow cheese-lover like us, go ahead and sprinkle a bit extra cheese on top—we won’t tell. If you’ve created the ultimate party snack or summer recipe, why not share it with the Kitchen Stories team and our hungry community? Simply send your recipe to community@kitchenstories.com.